The end was nigh, and so it was little surprise when, on Thursday, I got a call at work from Eleanor to let me know my services were needed. Her pet rat "Who Cares" had died and I was to make the coffin. I took some measurements and drew up a rough sketch using dimensions that seemed cozy. I opted for the traditional six-sided coffin style as opposed to the less typical movie projector or rooster styles. The Dictionary of Woodworking Tools by R.A. Salaman lists a few coffin makers tools. As a saw maker I was most interested in the coffin maker's saw. The entry says it was used for cutting a kerf at the shoulder of the coffin sides to allow the wood to bend into the familiar diamond shape. After running some tests using my Gramercy carcase saw, I found the radius of the bend to be problematic at the small scale of my rat-sized coffin, so I modified the design to use mitres at the shoulder. I started with a 15"x5"x1.25" piece of walnut. Too thick for the top or bottom, but thick enough to be resawn into the pair. After flattening one face of the board and laying out the shape of the top I sawed off the waste and squared all the edges using a plane and double square. With the edges squared, I marked the center line of the wood for resawing. The advantage of resawing after the work is cut to shape is that I end up with larger off cuts and save myself some time and improve accuracy by resawing a board with less width than the stock I began with. I clamped the wood to my work surface (see The Blue Thing below) and began sawing down the center of the line. Resawing is a process I have come to enjoy. The trick is to take the time to switch sides, so you cut from one side and then from the other. In the picture you can see I have the end grain tipped away from me. This is for two reasons. First, it's much easier to saw when the cutting stroke is cutting up the grain. To illustrate this principle, if I was using a saw that cuts on the pull-stroke I would have the end grain tipped towards me. Secondly having a clear view of two marking lines allows you to make sure your cutting along the plane you want to. After you saw past the top flipping the workpiece back and forth between the two opposite long sides it is possible to use the kerf on one side to guide the saw while you cut along the line you are looking at. On a side note: one night after work, Tim and I resawed a 5 foot long 12 inch wide piece of cedar using this technique to get a 60"x12"x.25" board. Who needs a band saw!? With the top and bottom separated, I flattened one sawn face, and cosmetically smoothed the other. 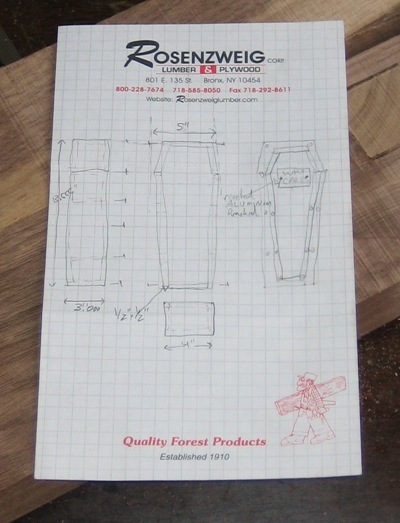 Since I was not using a bend to make the shoulder of the coffin, I decided to do away with case work entirely and attach the sides directly to the bottom. I set a marking gauge to slightly more than the thickness of the wood for the sides and marked the new dimensions of the bottom. I then used the same gauge to mark the extent of the lip for the coffin lid. I sawed and planed the bottom to size making sure the edges were square to the reference face. Cool, the bottom is done. I used 33.3% of my Clifton 3-in-1 plane to cut the lip around the edge of the lid. Using a scrap as a fence, I planed down the rebates. At this point it was only two hours until the funeral and my picture taking took a hit. Suffice it to say that the rest of the project is pretty straight forward. I used my carcase saw and and a bevel gauge to mitre the side panels. I pre-drilled and nailed the sides to the bottom. Then I sunk the nails with a punch and temporarily nailed on the lid to allow me to clean up all the joints, and flush up the lid to the sides with my plane. The finishing touch was an aluminum plate punched with "Who Cares" (the departed's name) and fixed in place with 4 nails. The funeral was a nice affair, and the coffin did its job. I was a little bummed that I couldn't find a way to make the kerfed and bent sides work, but after all, a funeral is supposed to be melancholy. The Blue Thing: Chris Schwarz's book on work benches is the best book I have read on the design of work surfaces. To sum up his writing: a work bench is something you use to immobilize your work piece. The Blue Thing was once a monitor stand in a gallery. Nowadays it lives on our porch. I've used several makeshift work surfaces, and this is one of the finest. The cut out portion allows you to clamp boards for sawing and jointing, and lets you clamp a stop to the top surface for planing faces. Often when I'm installing artwork in a gallery it needs a final touch up before the show opens, or something needs to be modified for installation. If there is one location that's less inclined towards securing your workpiece it is an empty gallery. I've used chairs, tables, friends, corners and stairs to stabilize work for planing, sawing and chiseling. By looking for features similar to the ones Mr. Schwarz highlights in his book such as legs at the edge of the work surface or the apron of the English workbench its possible to quickly construct an effective work holding strategy in the most austere of settings. We are surrounded by mini-Roubo benches, make shift crochets and camouflaged bench hooks. Great blog. I'm really enjoying your series. Great Blog! You did a great job. I have a question. What saw did you use to re-saw the walnut? I was trying to do the same with a piece of 8/4 birdseye maple (maybe that was the problem) and I had no luck. I couldn't get my handsaw to cut any of the maple. I ended up ripping as much as I could with my table saw and then finishing the job with my sawzall (which nearly killed me:)). Josh- The saw I used for the re-saw is an old H Disston and Sons. Its 8 ppi and 26 inches long. I sharpened it some time ago, which made a big improvement in its performance. Its filed intergalactic standard rip; no fleam, 0 deg rake. Props on the birdseye, that stuff is super cool. Surely the poor rat deserved a better name than that!